A recent meeting with Anna Volkova clarified one of the issues that went through my mind as I looked through the album assembled by James Upshaw, which was the subject of a recent post. 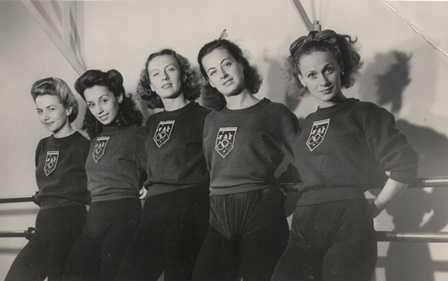 I was interested in several photos that showed some of the dancers wearing sweatshirts with a logo for an organisation with the acronym F.A.E on them. F.A.E., it turns out, stands for an organisation in Rio de Janeiro called, in English, Student Assistance Foundation, and in Portuguese, Fundação de Assistêcia ao Estudante. Volkova explained that some of the dancers, including Volkova herelf, gave a performance for this Foundation while in Rio. She identified the dancers in the photos for me, with the exception of a Brazilian dancer who had only recently joined them and whose name she no longer recalled. At this stage I’m not entirely sure when the performance took place. Update (1 February 2013): Tatiana Leskova has been kind enough to pass on some extra information about the photograph above and the concert in which the dancers performed. The Brazilian dancer was Leda Youky and the concert took place in Rio’s Teatro Municipal in, she believes, 1945. The dancers performed choreography by Vaslav Velchek—Anna Volkova danced to music by Mussorgsky (‘The Bumblebee’), Tamara Grigorieva and Tatiana Leskova to music by Rachmaninoff (Grigorieva to his ‘Prelude No. 2’, Leskova to his ‘Prelude No. 5’). Nini Theilade also performed, dancing her own choreography. Grateful thanks to the irrepressible Mme Leskova. I was a little surprised, but of course pleased, to receive a message through this website’s contact box from Latvia. The message concerned Vija Vetra, a dancer born in Riga, Latvia, who had studied in Vienna with Rosalie Chladek, had come to Australia in 1948, had joined the company of Gertrud Bodenwieser shortly afterwards and had toured with the company to New Zealand and around Australia. With Bodenwieser she performed in most of the repertoire from 1948 until the mid-1950s including as the Bride in The Wedding Procession (choreography Bodenwieser, costumes Evelyn Ippen, music Grieg), in which she is seen in the image below. She also danced one of the Aboriginal mothers in Beth Dean’s Corroboree during the Royal Gala season of 1954. Vetra moved to New York around 1964 and is still living there giving classes, lecture-demonstrations and workshops. She returns to her native Latvia frequently and is seen in the image below with a young student, Rasa Ozola, after a concert ‘Dejas sirdspuksti’ (Dance heartbeat) in Riga in June 2012. The 2010 publication Australia dances: creating Australian dance 1945–1965 by Alan Brissenden and Keith Glennon contains a brief summary of Vetra’s career in Australia (see page 224). An interview with Vetra recorded in New York in 2011 is at this link. In January I was pleased to renew my contact with Barbara Cuckson, initially as a result of a request from the Dance Notation Bureau in New York relating to Gertrud Bodenwieser’s early work Demon Machine. Cuckson’s mother, Marie Cuckson, was responsible, with Bodenwieser dancer Emmy Taussig, for maintaining a collection of archival material relating to Bodenwieser’s life and career, which is now now housed in the National Library of Australia. Barbara Cuckson’s father, Eric Cuckson, filmed several of Bodenwieser’s works and this footage is now housed in the National Film and Sound Archive. Barbara Cuckson continues to promote the work of Bodenwieser in many ways. The conversation turned to Errand into the Maze, which Bodenwieser made in Australia in 1954. German dancer/choreographer Jochen Roller is currently leading a project to investigate the ways in which Bodenwieser structured her ideas and themes, for which reconstructing Errand into the Maze is part. Cuckson provided me with the image below of a rehearsal conducted as part of the reconstruction process.